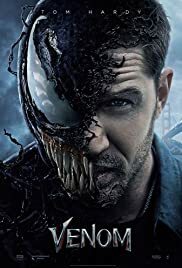 From Sony Pictures comes the Ruben Fleischer directed “Venom”, starring Tom Hardy, Michelle Williams, and Riz Ahmed. After a LIFE Corporation ship crash lands back on Earth, things begin to go haywire for Eddie Brock (Hardy), a local beat reporter uncovering the crimes done to the citizens of the California Bay Area. Along the way he gets thrust into an unexpected alien relationship that will change Eddie’s life forever. Ruben Fleischer is a director that revels in a self-aware attitude. Particularly with a film like Zombieland (2009) that has become an undeniable cult classic for its riff on zombie films. Now he tries his hand at everyone’s favorite symbiote laced reporter, Eddie Brock, in 2018’s Venom. Neither insulting nor trending towards “so bad it’s good” territory, Venom is a haphazard effort. Forty-minutes roar by in countless seams of exposition that lazily attempts to develop character building lore. There are a few instances that give audiences outside of the comic-book diehards a taste for the special layers beneath Brock’s journey. These instances are few and far between, and there appears to be a rather focused effort on making the film as detached from the audience as possible. As exposition spills out and characters repeat lines of dialogue as if we’d missed it, you begin to wonder when anything remotely interesting will happen. Around the 45-minute mark is when Venom traverses “so bad it’s good territory” with so-so visual effects and hilarious banter between Brock and Venom. We’ve finally received for what we signed up for and Hardy doesn’t disappoint. Seemingly the only one in the project that understands what film is being made, the rest of the cast pales in comparison. While Hardy gnaws on days old food and sweats plenty of weight off his bones, Michelle Williams and Riz Ahmed dance around a rather boring production design. When cut back to Hardy (who has most of the screen time as you’d expect) you can’t help but grin in wonder at how Hardy didn’t get locked up for being a deranged lunatic. It bodes well for the film’s most enjoyable moments and makes that final hour of Venom feel semi-worth it. This is by far, the only positive take away from the film. In the end, Venom is neither the travesty of Catwoman (2004) or Fant4stic (2015) nor the enjoyable romp of Batman & Robin (1997). It’s a dysfunctional affair with a script in shambles that’s penned by three (very) different writers, all who clearly had no vision of what they wanted this film to be. Director Ruben Fleischer brings nothing to the table in regards to style and it only hurts more when composer Ludwig Goransson nukes your ear drums in countless scenes. Venom might be worth buying the ticket so you can “see it to believe it”, but it’ll soon be lost in the peripherals of the genre.